Unlike mountain gorillas, chimpanzees in Rwanda are visited at a relatively low cost afforded by all travelers. A chimpanzee permit in Nyungwe forest national park costs $100 including park entrance fee and ranger guide fee. Travelers to Rwanda can therefore visit and track chimpanzees rewarding them with a memorable experience. Two chimpanzee communities have been habituated in Nyungwe forest and available forest trekking every day. Like in gorilla, a short briefing precedes chimpanzee trekking. 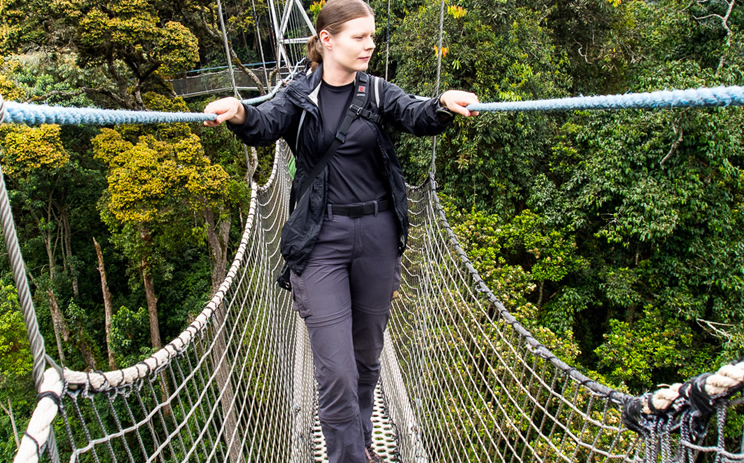 Still, in Nyungwe forest national park, travelers can also do canopy walk which rewards them with spectacular aerial views of the forest, wildlife, Virunga volcanoes, and the adjacent community villages among others. A canopy walk is 200 meters long and 60 meters above the forest. The two hours trespassing through the huge ancient trees is a not miss for each traveler to Rwanda. It was established in 2010 to diversify tourism products in Nyungwe forest and Rwanda as a whole. Go golden monkey trekking in volcanoes national park. It’s only in Rwanda and Uganda that visitors can see golden monkeys in their natural habitats. Golden monkey is such interesting creatures whose lively characters make them worth visiting. The golden fur of these species makes them distinct from other monkey species. An encounter with golden monkeys is a lively experience, the species jump continuously across branches which make an encounter with them an experience to remember. A permit to see golden monkeys costs $100, which is fairly cheap even for budget travelers. Do not miss hiking to the graveyard of Dian Fossey an American primatologist who lost her life to save gorillas that were at the verge of extinction. The merciless poachers in her defense for the mountain gorillas killed Dian Fossey. Visiting the graveyard is an appreciation of her efforts of gorilla conservation and is also one way of promoting gorilla conservation for the future. Rwanda is home to three of the Virunga volcanoes that make the Virunga chain of volcanoes. A hike to the summit of Mt karisimbi is an exceptional experience that lasts for a lifetime. Also, the slopes of Mt karisimbi shelter mountain gorillas, which give travelers and added a chance to meet mountain gorillas in their hiking sessions. Besides wildlife, Rwanda is home to over 700- bird species some of which are endemic to the region. Bird watching in Rwanda is well done in Nyungwe forest, along Akagera River and swampy shores of Lake Kivu. Among the birds to expect on your Rwanda birding tour include blue headed sunbird, regal sunbird, Rwenzori Turaco, Handsome spurfowl, Albertine Owlet, black headed HeronGrey-crowned double collared sunbird, Egrets, Grey crowned cranes,Grey-backed fiscal, African fish eagle, Lilac breasted roller, great blue turaco, spur winded lapwing, and double toothed barbet among others. Birders are reminded to carry binoculars, which help them to spot birds at a far distance.